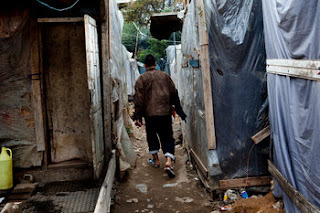 On a recent assignment in Greece, Zalmai Ahad discovered that more than 50,000 Afghan refugees who had fled the most recent war were living illegally in Greece — in the middle of the streets, in parks and under bridges and olive trees. It was particularly upsetting, he said, because he had also been a war refugee, fleeing Afghanistan in 1980 at the age of 15 to avoid conscription by the Soviets into the Afghan army. He went to Switzerland, where he was educated and still lives. When the Taliban were forced out of power a decade ago, he was able to return and has photographed his homeland for the last decade. Known professionally as Zalmai, his Afghan photographs were featured on Lens in 2009 and 2011. Because Greece shares a border with Turkey, it is the major land transit route into Europe for immigrants. But it is almost impossible for Afghan refugees to get official status. Racist graffiti and posters are commonly found in Athens, and there is an epidemic of anti-immigrant violence that is particularly directed at Afghans and sub-Saharan Africans. Zalmai says that there has been an increase of attacks over the last two years, while he has been covering the story. Zalmai Thousands of migrants, some asylum seekers, some refugees, have sought shelter in a makeshift camp near the port of Patras. The camp was closed by the police in July 2009, pushing the migrants out of the city, where they now live on olive tree farms. The attacks are associated with the rise of a neo-Nazi movement in increasingly restive Greece. Earlier this year, the far-right Golden Dawn Party won 18 seats (out of the total 300) in the Greek Parliament. In the beginning, Zalmai financed the project himself, although he later received an Emergency Fund grant from the Magnum Foundation. He also got some from Human Rights Watch. He spoke with and photographed many victims (Slides 1, 2, 4 and 10). One violent incident involved a 27-year-old Afghan asylum seeker (Slide 2) and two of his friends who were attacked in September 2011 by a mob. The man was hit on the head by a beer bottle and stabbed five times. Zalmai says he will continue to photograph Afghan refugees in Greece. Although his people have suffered through three decades of war, Zalmai says that at least the world knows what is happening in Afghanistan. He wishes that there was some awareness about the plight of his fellow Afghan refugees.